It’s no secret that Florida offers some of the mildest weather in the United States. Sure, warm and balmy weather is paradise, until you have a broken air conditioning unit, that is. Regular air conditioning maintenance can prevent your A/C unit from failure while significantly extending its service life. Of course, regular A/C maintenance ensures that your cooling equipment is working safely, efficiently and dependably. However, there are some other reasons you shouldn’t skip an A/C tune-up. Consider these reasons why you shouldn’t miss out on your annual air conditioning inspection and schedule yours as soon as possible. Not following regular air conditioner maintenance can cause certain components to become worn, overused, or damaged. A regular air conditioning inspection can identify these signs sooner and give you enough time to fix them before they turn into more serious, and more expensive, repairs. Using a poorly maintained A/C system will not only cause existing problems to worsen, but it will also likely cause your energy bills to rise. The buildup of wear and tear over the years creates more stress than necessary on your air conditioners components. Having an air conditioning maintenance technician do a regular tune-up on your air conditioning unit can have some big benefits including improving the overall energy efficiency of your home. Remember, the less energy that your heater or air conditioner consumes, the more you’ll save on monthly utility expenses. Most air conditioning units will come with a warranty. All warranties are different, however, it is common for these warranties to require regular maintenance. If your air conditioning unit is protected by a warranty, not having your air conditioning unit serviced regularly will cause it to become void. With regular A/C maintenance, you’re taking care of not only your air conditioning unit, but you’re also keeping your warranty (and investment) in tact. 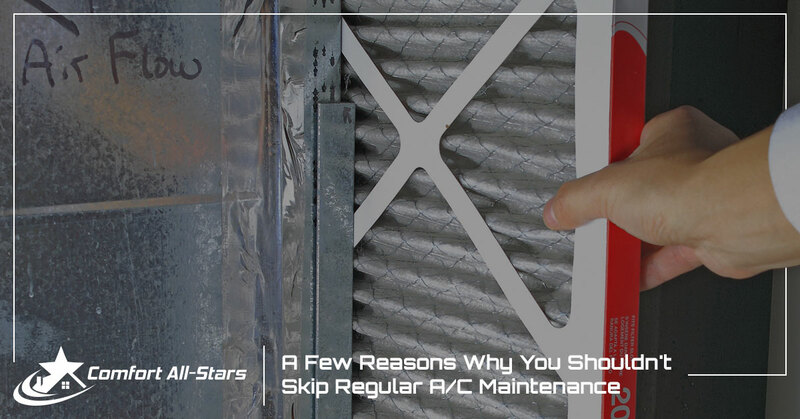 This is often one of the most overlooked problems of skipping regular maintenance for your air conditioning unit. All of the air in your home is filtered through your A/C unit, meaning the longer you put off regular maintenance, the lower the air quality will be in your home. Replacing the air filter and cleaning the coils is an essential part of regular maintenance that helps protect the air quality of your home as well as the health of you and your family. If you’ve been putting off regular air conditioning maintenance, contact the team at Comfort All-Stars Today! We’ll get you scheduled for a tune-up and have your AC running efficiently in no time!